So, you’ve built the world’s largest personal fortune, discovered and developed Saudi Arabia’s oil, married five times and haggled over the ransom to get your kidnapped grandson back. What do you do for an encore? 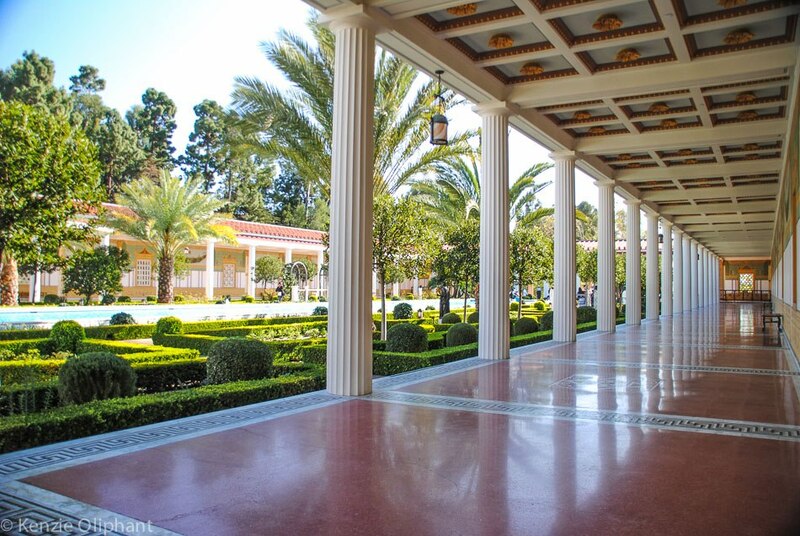 Why, you build a Roman Getty Villa in your backyard of course. It takes a certain kind of individual to recreate, from scratch, an entire Roman Villa on the grounds of your estate, high on a cliff overlooking the best beaches of Malibu – and legendary oil billionaire Jean Paul Getty was that individual. 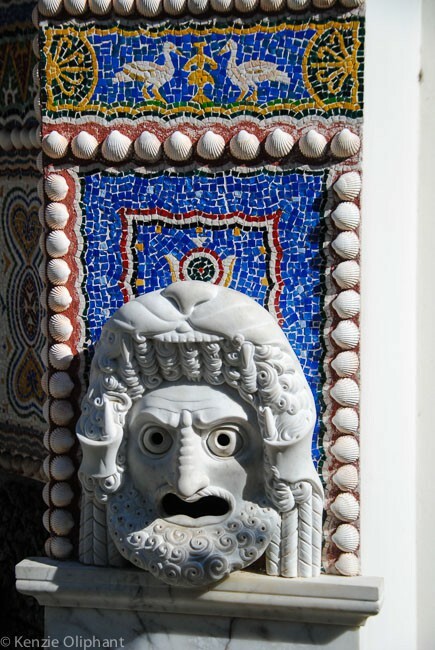 But where other billionaires might have done so to indulge their own ego or trumpet wealth and prestige (although I’m not going to say he didn’t have those motives as well), Getty created the Roman Getty Villa to house his own collection of ancient artworks and sculpture so they could be shared with the public. The Villa wasn’t just built as a museum but rather, as a living, breathing example of how a wealthy Roman citizen of stature would have lived. The result is both beautiful and intriguing at the same time. As you enter each room, you cannot help but pause to look around, not just at the artwork, but at the brightly painted walls, the contrasting marble patterns in the floors and the every-present light streaming in from hidden windows high in roof. 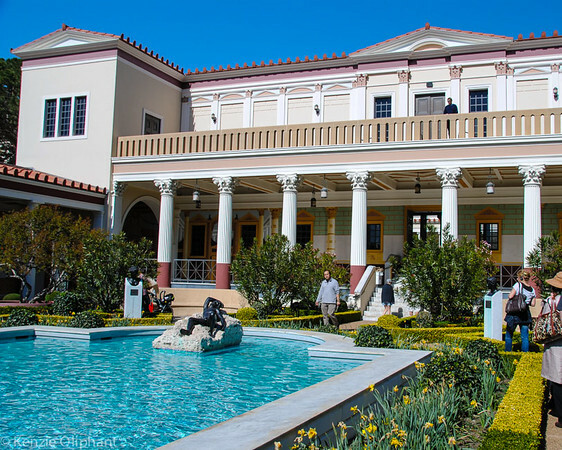 If you’re used to seeing Rome through the eyes of its ruins, the Getty Villa presents a fresh vision of spaces where meetings were held, meals shared, lives lived. Unfortunately, no actual Roman villa has survived in tact for the last 2000 years. Luckily for us (but not so much for the Romans), archaeology and the terrors of Vesuvius have gifted us some amazing insights. 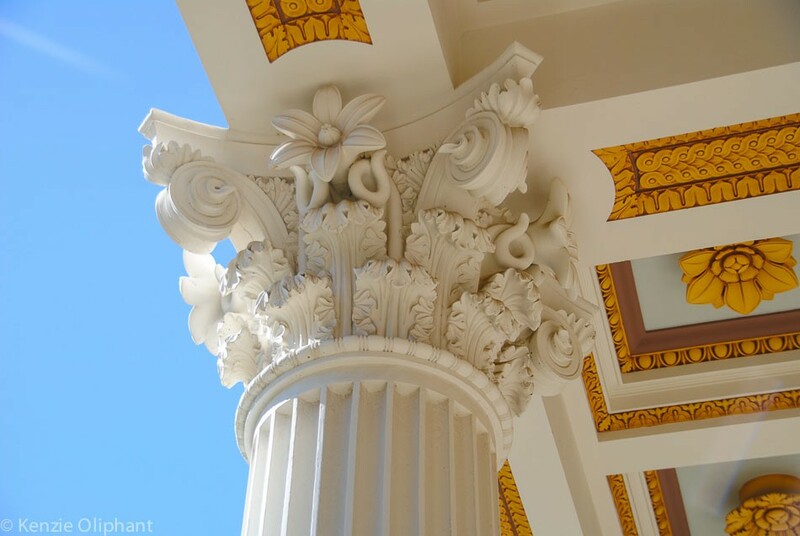 The Getty Villa built in the 1970s is the result of those discoveries and the genius minds behind the actual construction, Robert E. Langdon, Jr. and Ernest C. Wilson, Jr. Subsequent renovations completed in 2006 have further developed the site and the Villa. 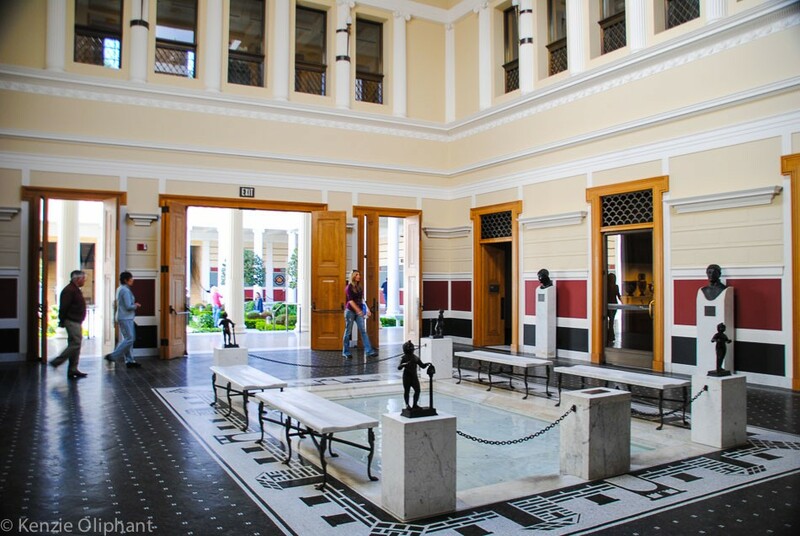 The building was inspired by the Herculaneum Villa dei Papiri which was buried by the Vesuvius in C.E. 79. 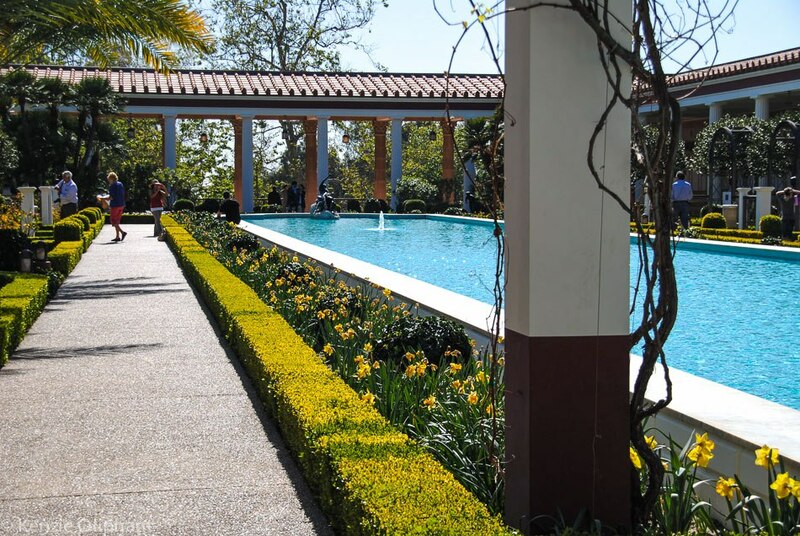 Since most of the Villa is not yet excavated, the Getty Villa architects researched other houses from the region in order to create something that might have actually existed in that landscape. The result is quite astonishing. 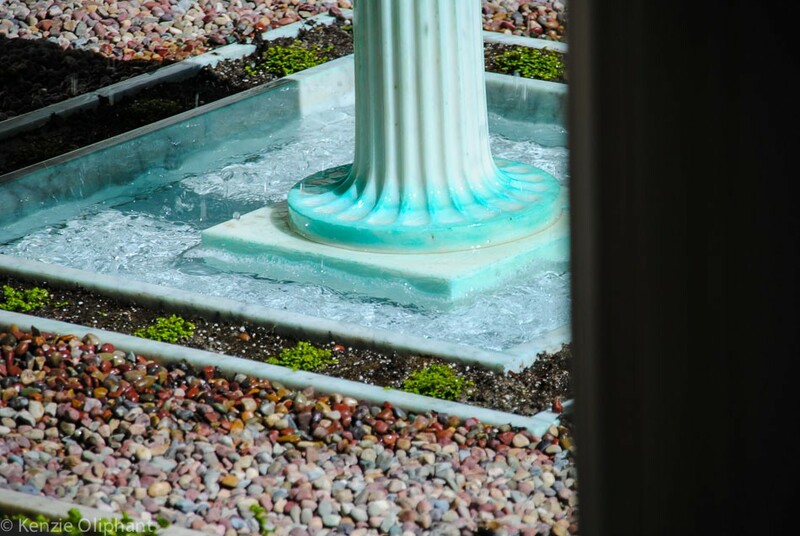 The gardens are also an attempt to accurately represent not only the exterior of a Roman villa, but also to provide a source of plants and food that were available to Romans. Much of what’s grown in the Getty Villa’s gardens is used in the Cafe – a pretty exciting way to sample the ancient world. The main collection has a wopping 44,000 items from the Greek, Roman and Etruscan civilisations (mostly housed at the much larger Getty Centre, in Los Angelos). Obviously not all of them are on show in the Villa, but you can see over 1,200 pieces across the galleries, each of which is set out to either highlight the works, or to naturally integrate them into the structure of the Villa, such as in the temple room. Rooms are laid out following a range of themes, showing incredible diversity across different periods and cultures. J. Paul Getty began collecting in the 1950s, at first opening up his home to the public for viewings. 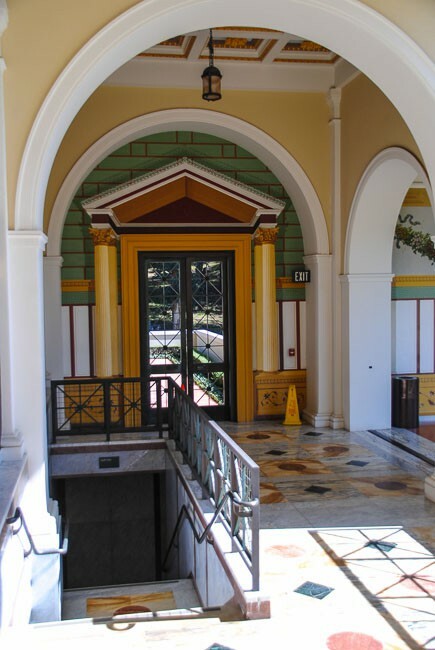 However, the collection quickly grew too big and plans for the Getty Villa began. Getty was a hard man, sometimes accused of having not heart. He amassed a breathtaking fortune but luckily for us, his passion for collecting antiquities was unaffected by his reputation as a penny-pincher. He left over $600million to the Museum and as a result, we have this amazing Villa and the Getty Centre today. That’s a legacy worth leaving. 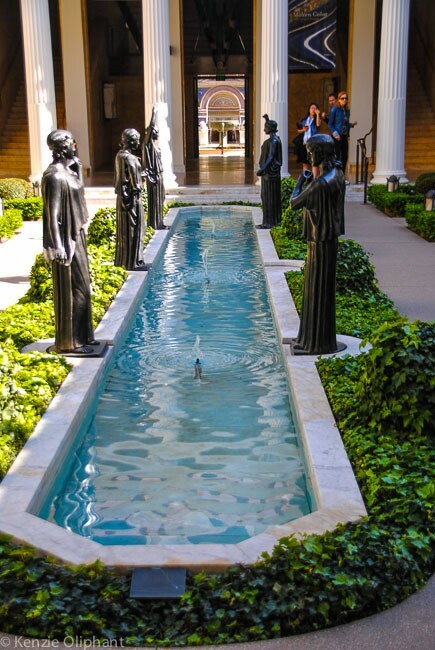 The Getty Villa can be found at 17985 Pacific Coast Highway, Pacific Palisades, California. It’s open every day except Tuesdays, Christmas, Thanksgiving and New Year’s. Entrance is free. You will need to pre-book a timed entry ticket, which you can easily do via the website. A free multimedia player is available as a guide to the museum. Parking on site does have costs – but if you see both the Villa and the Getty Centre on the same day, you pay once and park at both sites. 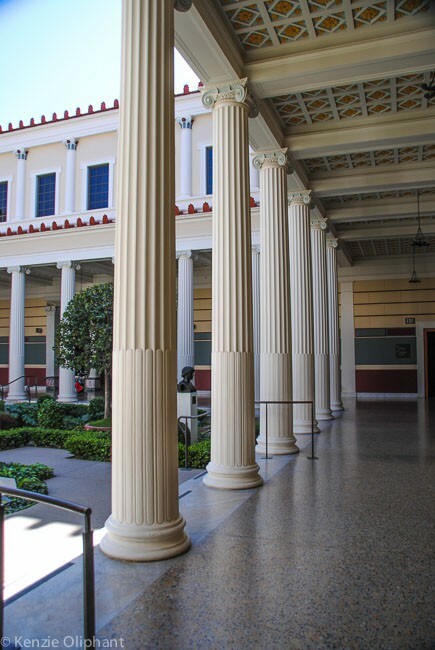 The Getty Villa also offers lectures, tours, films and other events. There are also regularly changing exhibitions. Can be easily reached by bus from Santa Monica on Bus 534, running along the beach every 10 minutes. You can find route information from the LA Metro Trip Planner.